Sérum S.O.S Mitigating moisture absorber vegetable! With grape Water bio, hyaluronic acid and antioxidant Polyphenols, captures and disseminates continuously water at depth, to restore the water balance of the skin regains softness and freshness. Grape seed polyphenols, the strongest antioxidants in the vegetable world known so far. The Grapeseed Oil is a thin and light oil, rich in omega 3 and vitamin E, which nourishes and regenerates the skin. The Vinolevure ® is an amazing molecule extracted from the wall of wine yeast, with ability to retain hydration of the skin and strengthen the immune defenses of the latter. The formulas are no Parabens, no phenoxyethanol, phthalate-free, no mineral oils, no sodium lauryl sulfate, without dyes or synthetic ingredients of animal origin. Apply morning and evening, on cleansed face and neck. Then, apply the day or night cream. The Vinosource line Caudalie has as the key asset: Bio Grape Water. Extracted directly from fresh grapes, this patented vegetable water, is rich in calming oligoelements elements (potassium and calcium) and moisturizing sugars, such as the thermal waters. Thanks to its moisturizing and softening properties, Vinosource line is the S.O.S care so your skin never misses water. THE APPLICATION OF YOUR BEAUTY PRODUCTS, BY THE RIGHT ORDER, IS SUPER IMPORTANT BECAUSE YOU POWER YOUR ACTION. WE GIVE ALL TIPS AND ALL PRODUCTS TO BENEFIT IN FULL OF YOUR BEAUTY SLEEP! 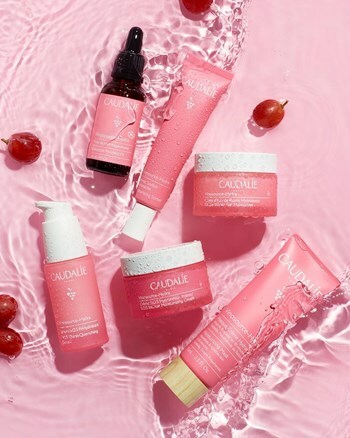 Caudalie has renewed its Vinosource line and dressed it in rose, and we could stop being rendered to this feminine and delicate new image.